The Sahara Desert is the world's largest hot desert, covering much of North Africa. The adaptations of the wildlife and plants to the treacherous environment are fascinating, and the cultural history of this geographic crossroads complex and involved. The dromedary camel, one of the Sahara's most famous animals. The Sahara's environment requires that the wildlife adapt to hyper-arid conditions, fierce winds, intense heat and wide temperature swings. In the heart of the Sahara, for instance, most mammals are relatively small, which helps to minimize water loss. They often meet their water needs from their diets. They take refuge in burrows during the day, hunting and foraging primarily at night, when temperatures are lower. They have developed anatomical adaptations such as the fennec fox's large ears, which help dissipate heat, and its hairy soles, which protect its feet. Altogether, the Sahara hosts some 70 species of mammals, 90 species of resident birds, 100 species of reptiles, and numerous species of arthropods (invertebrates that have jointed limbs, segmented bodies and external skeletons). The animals include, for a few examples, Barbary sheep, oryx, anubis baboon, spotted hyena, dama gazelle, common jackal and sand fox; the birds--ostriches, secretary birds, Nubian bustards and various raptors; the reptiles--cobras, chameleons, skinks, various lizards and (where there is sufficient water) crocodiles; and the arthropods--numerous ants, scarab beetles and the "deathstalker" scorpion. 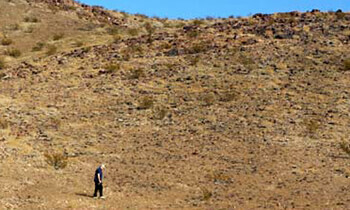 The wildlife is concentrated primarily along the less severe northern and southern margins and near desert water sources. 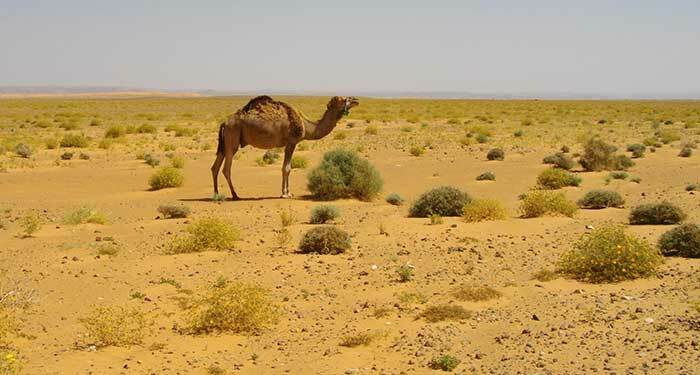 Perhaps the Sahara's most famous animal is the dromedary camel, domesticated for thousands of years and long used by the desert nomads. Relying on its fat-filled hump and other physiological adaptations, the dromedary can travel for days with no food or water; with its large thick lips, it can feed on thorny plants, salt-laden vegetation and dry grasses; with its thick footpads, it can negotiate rocky and sandy terrain; with its slit nostrils and heavy eyebrows and lashes, it can protect its nose and eyes from punishing sandstorms; and when given water, it can consume more than 30 gallons in a matter of minutes, preparing for more hot dry days. their growing cycle before the soil dries out. 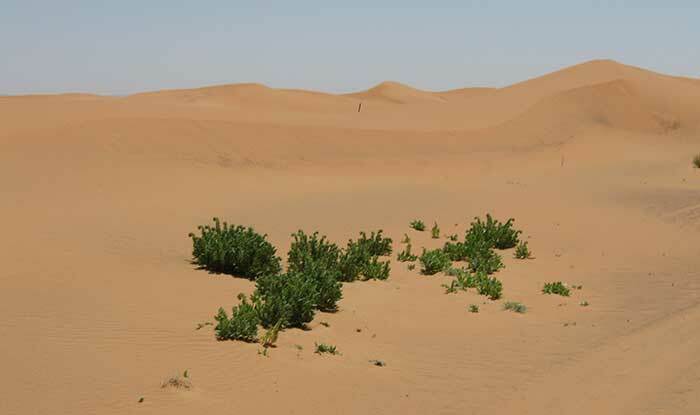 Like all deserts, the Sahara harbors a relatively sparse community of wild plants, with the highest concentrations occurring along the northern and southern margins and near the oases and drainages. It has imposed adaptations on the plants. For instance, near wadis and oases, plants such as date palms, tamarisks and acacia put down long roots to reach life-sustaining water. In the more arid areas, the seeds of flowering plants sprout quickly after a rain, putting down shallow roots, and completing their growing cycle and producing seeds in a matter of days, before the soil dries out. 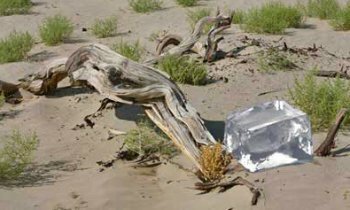 The new seeds may lie dormant in the dry soil for years, awaiting the next rainfall to repeat the cycle. In the most severe areas -- for instance southern Algeria's Tanezrouft Basin, a fearsome mosaic of salt flats, sandstone and sand dunes known as the "Land of Terror" -- plants have been able to establish only the most tenuous foothold, leaving much of the landscape virtually barren. 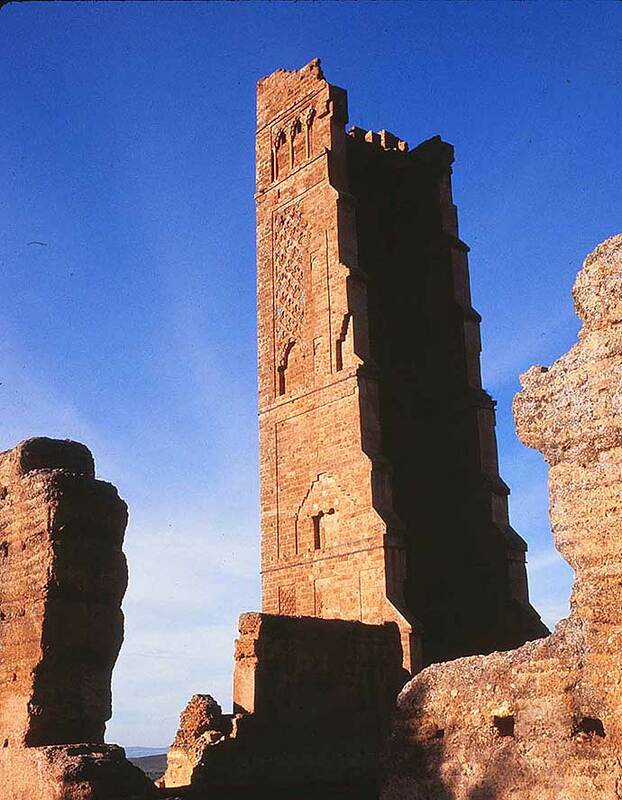 Ruins of a mosque, its minaret still standing prominently. Located in the Atlas Mountains, at the northern edge of the Sahara, the ruins date back to the early days of Islam in North Africa. Across the central, most arid part of the Sahara, the plant community comprises perhaps 500 species. By comparison, in South America's Amazonian rainforest -- probably the most biologically rich region in the world -- the plant community includes, according to the estimates of some authorities, well over 40,000 species. According to estimates, the Sahara's entire population probably equals less than two million people, including those who live in permanent communities near water sources, those who move from place to place with the seasons, and those who follow the ancient trade routes as permanent nomads. Most have Berber and/or Arabic roots. 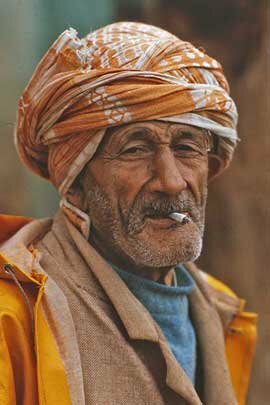 The Berbers, speaking several dialects of the Berber language, appeared on the scene at the dawn of the Sahara's history. Aging man whose face shows his Berber and Arab heritage. The Arabs, speaking Arabic, a Semitic language that originated in Arabia, appeared on the scene thousands of years ago. Most of the Sahara's population follows the Islamic religion, introduced in the seventh century AD. The Sahara's history is written in terms of primitive hunting and gathering, nomadic trade, agricultural development, early communities, conquest, sophisticated civilizations, monumental architecture, dynasty, exploration, colonization and war. It bears the stamp, not only of the Berbers and early Arabs, but also of Egyptians, Nubians, Phoenicians, Greeks and Romans. In more recent centuries, it experienced the imprint of Ottoman, Spanish, Italian, French and English colonialism. In the nineteenth century, it heard the whisper of Roman Catholicism. During World War II, it suffered fierce and destructive battles between the Germans and the Allies. In the middle of the last century, its countries cast off their colonial yokes and found freedom. Explore dune fields, oases, the Nile and Niger rivers and even the most barren areas, (for instance, the Tanezrouft Basin--the Land of Terror). See exotic wildlife such as the Barbary sheep, oryx, hyena, jackal and sand fox as well as various birds and reptiles. Join hiking and camel treks, recalling ancient nomadic trading caravans. Visit stunning monuments to the human story in the Sahara, for instance, the standing ruins of ancient cultures and the edifices of more recent cultures. 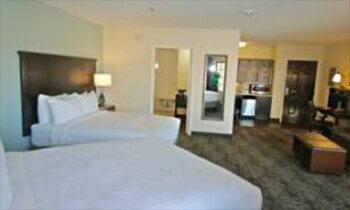 Enjoy the rich fare of ancient, but still lively, bazaars and marketplaces. If you have not traveled in the Sahara and you are not familiar with the local conventions and standards, you should consult a travel agent, who should provide the information you will need for a rewarding trip. Saharan woman, traditionally dressed, at communal well. Berber as well as Arab nomads took their caravans of camels across the Sahara, trading in goods such as cloth, desert salt, gold and slaves. The narrow strip of desert land along the Atlantic coast sustains various lichens, succulents and shrubs. The organisms take their moisture from fogs produced by the cool Canary Current, which parallels the coast, just offshore. The crescent dunes, driven by the wind, may travel several yards in the course of a year. 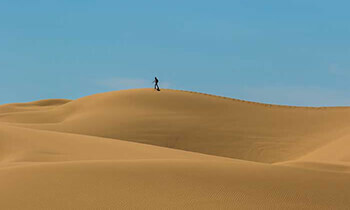 More - Read about the Sahara's Geography and Climate.